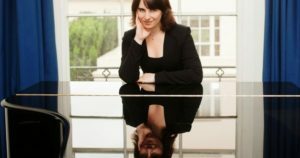 The internationally acclaimed pianist and composer Alissa Firsova will renew her partnership with St Albans Symphony Orchestra (SASO) on Saturday 6 May, performing a pillar of the classical repertoire: the Piano Concerto No 1 in D-minor by Brahms (7.30pm St Saviour’s Church, Sandpit Lane, AL1 4DF). Alissa grew up in St Albans after her composer parents moved to the UK from Russia and studied both piano and composition as a teenager Hertfordshire’s Purcell School. She made her performing debuts at London’s Wigmore Hall and the BBC Proms in 2009, which was also the year she began a post-graduate course in conducting at the Royal Academy of Music. Despite the exceptional demands of her triple career as a composer and conductor as well as soloist, Alissa still makes eagerly-attended appearances in her home town with SASO and in chamber music. During preparations for the Brahms concerto she spent time studying and performing at the house the composer himself rented in the German spa town of Baden Baden, where she was engaged for a month-long residency. Recently she also conducted members of Amsterdam’s celebrated Concertgebouw Orchestra in her composition, Le Soleil de Conques. In May, she will perform Dvorak with the Tippett Quartet at the Haslemere Festival, together with her Tennyson Fantasy quartet, which is being recorded for a CD dedicated to her music. The Brahms concerto is conceived on a grand, symphonic scale and provides the entire second half of SASO’s concert. Although a firm concert favourite for more than a century, it took audiences by surprise when first performed in 1859 by treating the orchestra as an equal partner with the soloist, rather than accompanists for a display of keyboard virtuosity. Listeners today are more likely to be struck by the concerto’s successful mixture of drama, tender lyricism and classical rigour. Memorable themes are developed using technical forms that Brahms’ predecessors, Beethoven and Mozart, would have had no difficulty recognising. By way of contrast, SASO under its principal conductor Tom Hammond, will open their concert with two romantic ’tone poems’ by Sibelius – both celebrated examples of his musical story-telling inspired by Finnish folk legends. Pohjola’s Daughter is based on the folk legend of a hero who struggles – excitingly, but unsuccessfully – to win the hand of a maiden found spinning golden thread at the foot of a rainbow. In the case of En Saga, the audience are free to invent a own fairy tale of their own to go with the music, since the composer provided no details of the story suggested by his title. He did, however, suggest that the restless and often melancholy music was partly a psychological self-portrait.